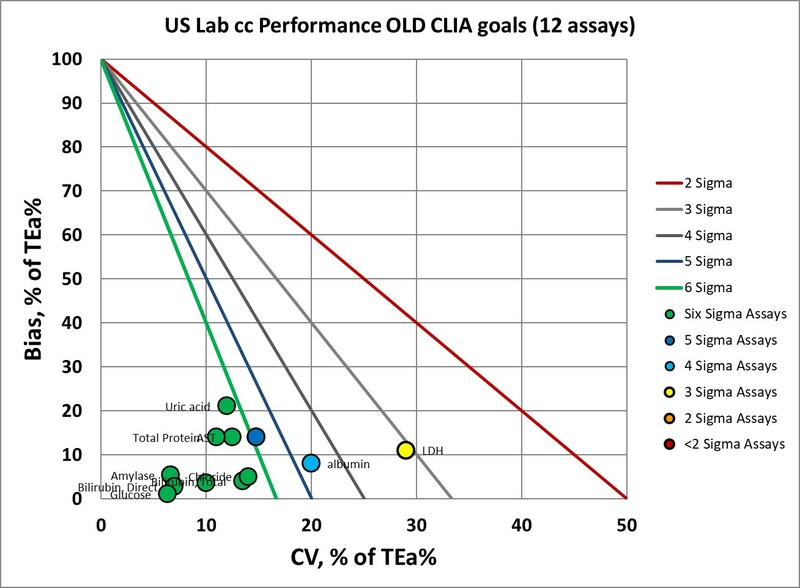 The 2019 proposed changes for CLIA proficiency testing acceptability criteria have significant consequences for laboratories that adopt them for analytical performance specifications. Here are a few examples. 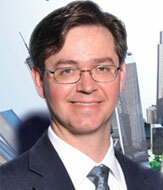 The CLIA goals may be changing. The proposed tightening of goals is listed in the Federal Register. In principle we have discussed these changes here and here. But it's useful to see how an individual laboratory might be impacted. 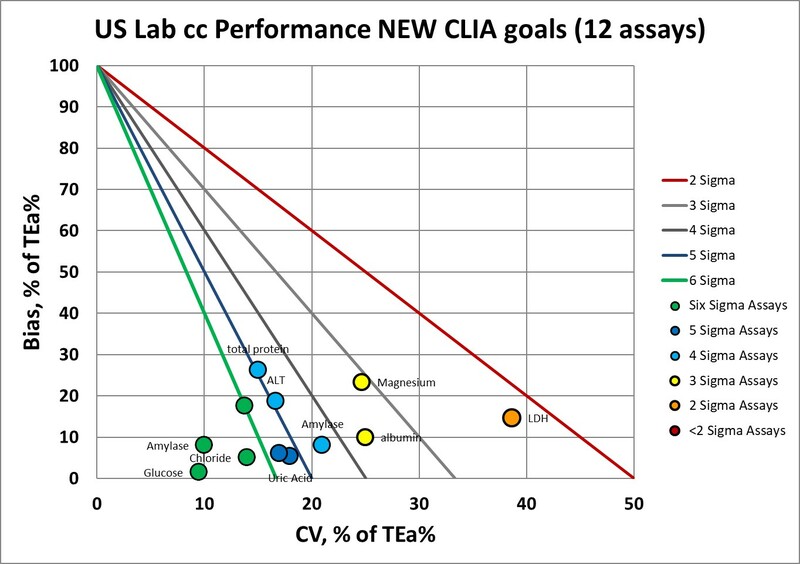 So we used performance data available in our Sigma VP program, to look at some US laboratories and estimate what they would see in a change of goals. Note that these CLIA goals explicitly have stated that the new goals are meant for PT scoring only, not for individual performance specifications. But that's a bit of sophistry on their part. It's inevitable the new CLIA goals will be used like the current goals. Not only will CLIA acceptability criteriabe used to judge proficiency testing, they will be used to validate individual laboratory methods and they will also be adopted as analytical performance specifications. Taking a look at 20 biochemistry methods from one of our Sigma VP labs in the US, we note that 8 of the 20 examined anlaytes did not change. The new CLIA goal is still the same old CLIA goal. So only 12 analytes had changes, but all of those were tightened. Where we had 9 assays at 6 Sigma, now we have 4. Where we had 1 assay at 5 Sigma, now we have 2. Where we had 1 assay at 4 Sigma, now we have 3. Where we had 1 assay at 3 Sigma, now we have 2. Where we had no assays below 3 Sigma, now we have 1. It's a significant number of analytes being shifted down in Sigma categories. We would predict that this results in more rules being necessary for QC, for the lower Sigma metrics, even an increase of numbers of controls, and if QC frequency tools are being used, this would also result in higher frequencies of QC. More rules, more controls, more often. 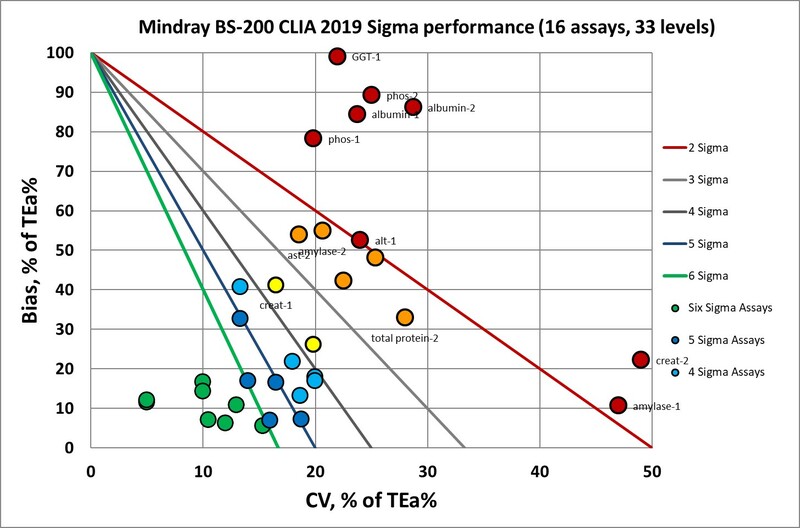 Earlier this year, we took the package inserts of the Mindray BS-200 and used those estimates of performance to assess Sigma-metrics based on CLIA and EuBIVAS performance specifications. Now let's update that with an assessment of the new CLIA goals. 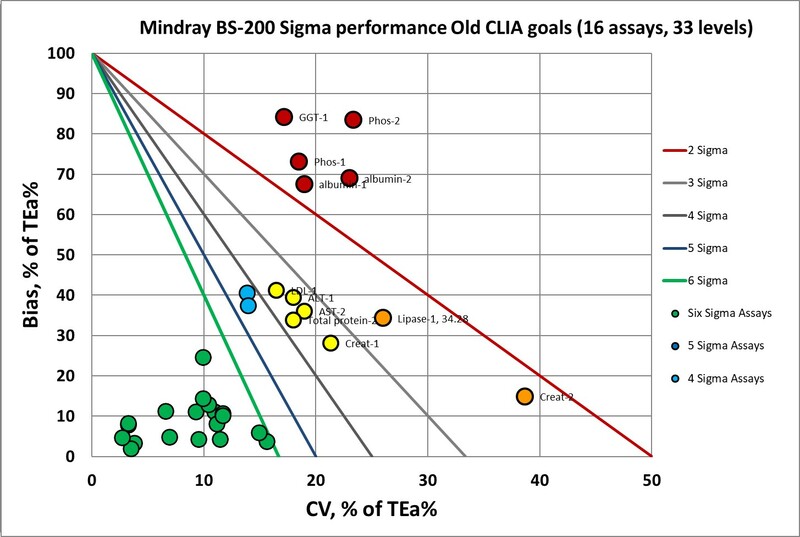 Here is the assessment of 16 biochemistry assays where the CLIA goals have been tightened. In 15 of those assays, we are plotting both high and low controls. For CK, they had three levels of controls. Under the current CLIA goals, there are 19 levels at or above 6 Sigma. Which is cut by more than half, to just 8, under the new CLIA goals. Where we had 19 data points at 6 Sigma, now we have 8. Where we had nothing at 5 Sigma, now we have 5 data points. Where we had 2 data points at 4 Sigma, now we have 5. Where we had 5 data points at 3 Sigma, now we have 2. Where we had 2 data points at 2 Sigma, now we have 5. Where there were only 5 data points below 2 Sigma, now there are 8. Clearly the new goals make bad instruments look worse.